A consummate hard worker, the Entlebucher Mountain dog is a smart and confident, cheerfully energetic and protective of everything that it considers to be its own. A fast learning breed that loves to be as close to its owner as possible, making them excellent for "off leash" endeavors; you'll not have to worry about this breed taking off if you've trained them well. Playful yet serious, this dog both entertains and works hard; this leaves the owner with the job of constantly finding activities for their dog to engage in. This breed requires high energy jobs and regular exercise in order to remain mentally and physically healthy. It is important that potential owners understand that this is a herding dog that will not stop at herding children with an occasional nip in the right direction. This is a good breed with children and other pets when raised with them from puppyhood. The Entlebucher Mountain Dog is a highly intelligent and somewhat dominant breed. Training from early puppyhood is important to help the dog understand its place in the family hierarchy. Potential owners should be aware that this is a highly active dog that requires regular exercise; though it would be suitable for a small space such as an apartment if exercised daily. Little grooming of the breed is necessary; some breeders may dock the tails of this breed. This breed is prone to torn anterior cruciate ligaments deep within the knee joints, a condition which requires orthopedic surgery. Additionally, many are born with a urinary tract condition recently identified as Entlebucher Urinary Syndrome, in which the anatomy of the urinary system is incorrect. Some dogs will not show symptoms; those that do can be medicated. One of the Swiss Mountain Dogs, this breed is descended from the ancient Roman mastiffs brought through Switzerland about 2000 years ago. 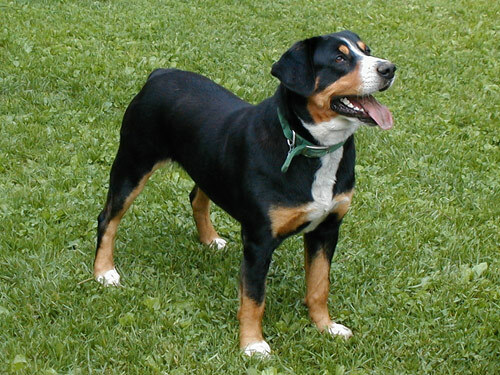 The Entlebucher Mountain dog is the smallest of the breeds and has been used primarily for herd guarding. The first standard for the breed was developed in 1927 and they have been shown since, though they did not receive AKC recognition until January 2009. Despite their status as an excellent working and family dog, they are rather rare on the canine scene.